For the first time in a long time, Easter is going to be in March this year. Personally, I dislike it since I’ve been patiently waiting for almost 28 years now for Easter to fall on my birthday. My mom has had it happen twice. The closest I’ve gotten is Good Friday, which is nice, but not the same. Anyway, the thought that Easter was nearing was in the back of my mind when I received my March Secret Recipe Club assignment of Leah’s blog, So How’s It Taste? I laughed when I read that Leah initially had to beg a college roommate to make her a grilled cheese because Tom likes to say that he made me my first “real” grilled cheese when I was 22 (23?) years old. My mom had always burnt them beyond being edible and once I was old enough to make them myself, I would just toast a slice of cheese on bread in the toaster oven, so its true that I didn’t have a real grilled cheese, in the sense of slices of American cheese between two generously buttered pieces of bread cooked to a golden brown in a skillet until he made one for me. I had an extremely hard time choosing a recipe from Leah’s blog. I made a list of probably 20 recipes that I wanted to try. But, finally when I clicked on this cake, I immediately knew it was what I needed to make. First, its pretty and second, I rarely remember to make something for a holiday before the actual holiday, meaning its semi-pointless to share it with you. But not this time! 1. Prepare cake of your choice in two 8″ or 9″ pans according to recipe directions. Let the cake cool and then slice off any pieces to make the cake flat. 2. Spread a glob of the icing on top of one cake and place the other cake on top. Spread a thin layer of icing on top of the cake and then, work in sections to ice the sides of the cake, pressing the kitkat bars to it as you go. 3. Put the shredded coconut in a ziplock bag and add the food coloring. Shake the bag and massage the coconut until the food coloring is evenly distributed and the coconut flakes have turned green. Sprinkle a thin layer on top of the cake, just enough to cover the icing. 4. Arrange the Cadbury Mini Eggs on top of the cake in your desired fashion. Tie a ribbon around the cake. To serve, remove the ribbon and slice between the kitkat bars. Isn’t this cake just incredibly adorable? I don’t even want to eat it! I just want to stare at it instead. If you choose to go the store bought route for the cake and icing, this really takes no time at all to prepare. The bulk of the work is opening the kitkats, not even adhering them to the cake. I love this cake – made a very similar version last summer. Yours is adorable! Super cute cake!! Kids will love this! Just adorable!!!!!!!!!! YUM! Stopping by from http://www.itsgoodtobethecook.com for the SRC March Reveal. Can't wait to read more from your blog! Oh wow, what a cute and delightful cake 🙂 Love it! Your cake is just gorgeous! Thanks for checking out my SRC entry Loaded Potato Soup. That cake is as cute as ever. Wonderful SRC. How beautiful! The perfect center piece! That is a cute cake! you did a wonderful job! This looks so cute and impressive. Perfect for Easter! Cute cake and great picture! You did a great job with this one! Yay well done for getting in before Easter! I know what you mean with Easter and Birthdays. I'm the 22nd of March and so far I've had an Easter Saturday Birthday. My mum's the 26th and she's had nearly every Easter holiday! I keep forgetting when Easter is this year. This cake looks too cute to eat! Great pick for the swap! This is so cute!!! What a great Easter centerpiece. Isn't it great when something so simple looks so cute! What a great Easter Cake. 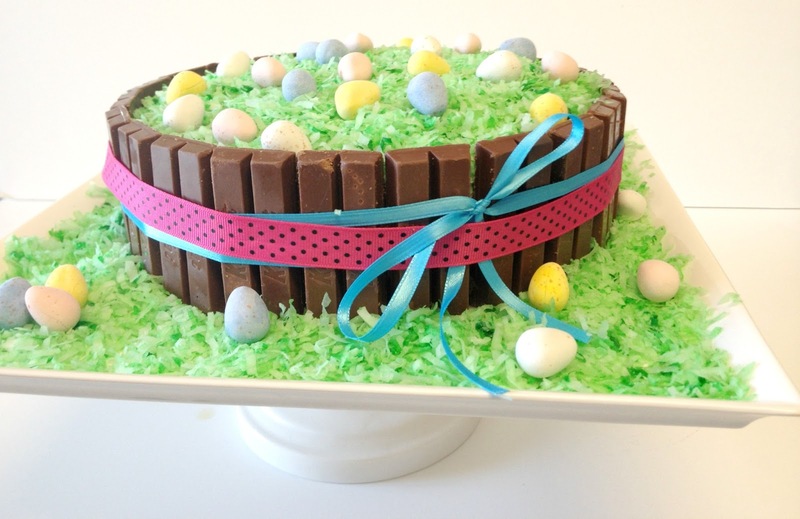 Your Easter Kit Kat Cake is just beautiful, great presentation. Thanks for sharing and have a good week. 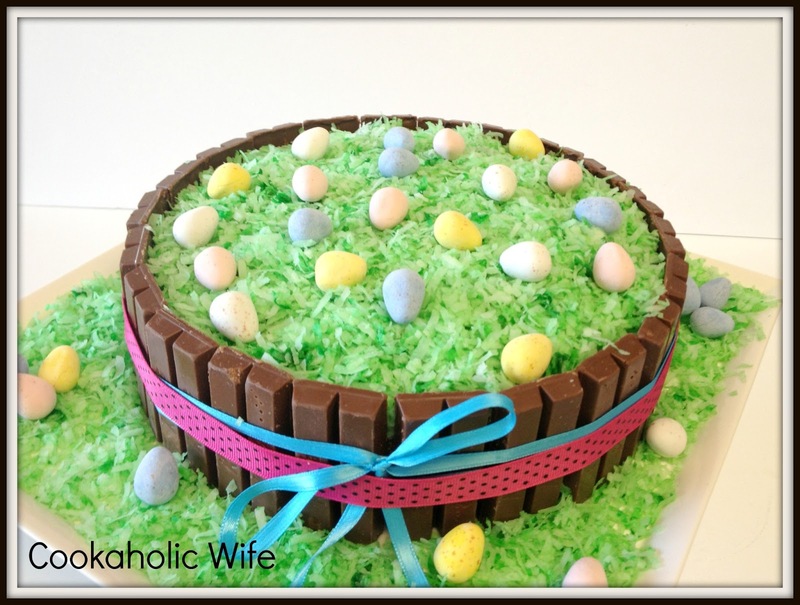 What a fun idea for an Easter cake. 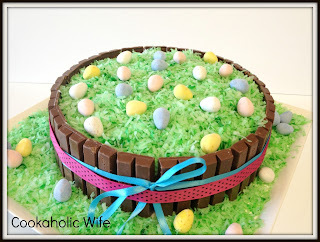 I've been wanting to make this KitKat cake that I see everywhere, but love the idea of an Easter theme. Great job! Hi Nichole! I'm so glad you picked this cake. I think it's just so cute and I get a kick out of seeing others make it. I like how you sprinkled the "grass" around it too. Super cute! what a fun cake! my birthday is at the end of april, and it's always just a bit shy of easter, though we have combined my birthday + easter celebrations in the past, like when i was home from college. great SRC choice! So cute! I agree with you…can't believe that Easter is THIS month. I might try to make individual "baskets" with this. That is so adorable! I love it! I'm with you in preferring Easter be in April. It fell on my birthday in 2003 (there was also a double rainbow that day; cool!) and will again next year. Easter is my favorite Christian holiday, so I love to celebrate. This cake would be the perfect addition to my spread this year. This is such a cute cake! I've always wanted to do a kit kat cake and your cake is so inspiring. Fun pick for SRC!